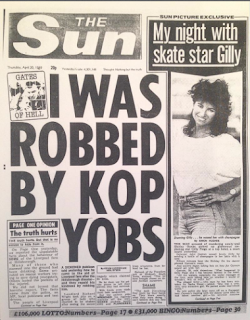 It’s often assumed that the shame of the Super Soaraway Currant Bun over the Hillsborough stadium disaster of 1989 was all down to one highly unfortunate front page story. But, thanks to a Zelo Street source, I can reveal that there was rather more to it than that. The paper began its crass disrespect of the 96 with the issue the came out the Monday after the event - and carried it on all that week. But let’s start at the very beginning, as it’s a very good place to start. The Sun’s first edition after the fatal crush at the Leppings Lane end of Hillsborough, on Monday 17 April, splashed a front page photo so disturbing that it will not be reproduced here. Under the headline “THEY DIED SO YOUNG”, readers saw over their breakfasts a tangled mass of bodies crushed against the security fence, some of whom were either dead or dying. The Sun didn’t care even then. It just went ahead and published. At the foot of the page was the needless observation “This was the nightmare of Hillsborough. Young fans battle for breath as they are crushed in the soccer disaster that claimed 94 lives. Fencing designed to stop hooligans had killed the innocent”, before the characteristically OTT “16-PAGE SUN DISASTER SPECIAL STARTS ON PAGE 2”. “THE TRUTH” actually contained a grain of truth. The revulsion at the decision to smear Liverpool fans with the Wednesday 19 April edition of the Sun may have diverted attention from the photo at right centre. The caption reads “Opened the gate … Superintendent Marshall”. For many years, it was claimed that Liverpool fans battered the exit gate down. Marshall eventually came clean. The smears didn’t stop with the Wednesday edition. The next day, readers were told “I WAS ROBBED BY KOP YOBS”, while an editorial showed that, at the time other papers were rowing back on using the same claim that got the Sun into such trouble, Kelvin McFilth shunned the chance to do so. “The truth hurts” it was headlined, going on to tell “THE truth hurts. But that is no excuse to hide from it”. There was more. “On Page One yesterday, we reported the unpalatable facts about the behaviour of SOME of the Liverpool fans at Hillsborough … Many of those who stormed into the ground had been drinking. Some urinated on rescue workers trying to save dying youngsters. Others looted the pockets of the injured … We did not invent that horrific report. The facts came from the Police, an MP, local publicans and taxi drivers”. And yet more. “The people of Liverpool are angry that The Sun published the truth. Misguided local radio DJs urge listeners not to buy the paper … Will that bring back the dead? Of course not … But hopefully, telling the world exactly what went on at Hillsborough will mean that something is done to prevent such a disaster happening again … If the price to be paid is that some of you stop buying the Sun, then so be it … You have a choice … The 95 who died at Hillsborough had no such choice”. 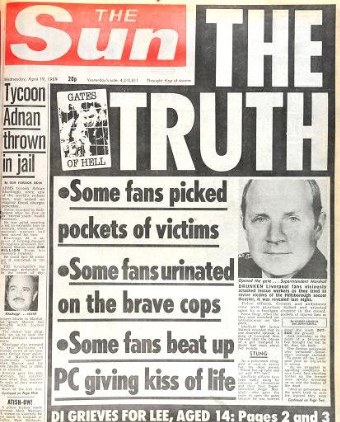 Patronising, bullying, and yes, just plain lying, the Sun began its disrespect of the 96 before Kel made his fateful mistake, and carried on afterwards, rubbing Merseysiders’ noses in it for good measure. And the editor who ran all those stories still works for the paper. Small wonder much of Liverpool still won’t buy the Sun. But Kelvin was only in his early forties. What do you expect of a juvenile of that age? And he was only possibly following advice from Uncle Rupe? Incredible though it may appear, there is something much more evil and much deeper even than the Mackenzie and Murdoch boot boys cowardice. Because they weren't the only ones to join in. Nor did the anti-Merseyside propaganda stop there. All you have to do is dig back through newspaper archives for the same propaganda-clerk behaviour targeted at Merseyside and you'll find example after example of - no exaggeration - the kind of disgusting fascist filth "pioneered" in Nazi Germany. When people fought back it was described as "self-pity." But that was just the beginning - it was then widened to include anybody and anything opposed to the ur fascist agenda manufactured inside the M25. It actually poisoned every part of national culture and at all levels. It started of course well before the Hillsborough Disaster. It REALLY began after the country-wide riots brought on by the tories in the early 1980s. This was exposed when previously secret government documents were published via the thirty years rule. In these, Howe (Chancellor), Brittan (Treasury) and Jenkin (Environment) all wanted to eliminate references to Merseyside, population a little under 2 million, as "...a viable social and economic entity..."
Needless to say at the time this got around whether "secret" or not. The result was an unprecedented economic and propaganda attack on Liverpool, a city then and now resolutely and democratically opposed to neocon fraud and lies. Later still, the attacks spread against everyone else of similar views. Hence the scuttle and deindustrialisation of Britain that has caused so much damage outside the M25 ghetto. Yet later, it led inevitably to the hacking crimes. Even now we have seen only the tip of the iceberg. The far right propaganda clerks and hacks who manufactured that muck then and now are the lying low-life of this country, the very worst people. After thirty years and more of this filth there is no longer any reason for performing the smallest task that aids them in any way. That applies right across the board. If union leaders had the slightest sense of courage they would organise members to take the necessary action - as Roy Lynx found out the hard way, if you go along to get along you only end up hiding underground after they betray you. 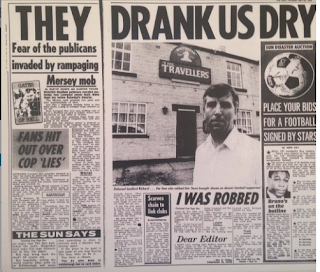 A spontaneous boycott destroyed the Sun's circulation on Merseyside in spite of all the propaganda, in spite of sickening opportunists like Ian Jack, Edward Pearce and a whole host of tenth rate "writers," in spite of media-wide attacks. The price paid was a terrible one, as it was for mining and industrial communities everywhere outside the M25. But at least those who resist can look at themselves in the mirror and know they tried. If this country is to survive as a democratic nation it had best learn the lesson and learn it fast. If not, the future is bleak indeed. I've always thought, and maintained, that the biggest clue to the dodginess of the entire 'truth' article was always there for all to see. Read it again. 'Some fans' this, 'Some fans' that. Some? That's not McKenzie. That's not Tabloidese. That's covering your arse. I see today's Sun website Hillsborough article is written by a "staff reporter". Where's Kelvin today? Nothing to say or is he still making it up? Absolutely right. This was all part of the agenda to destroy Liverpool. Thatcher and her henchmen had long decided on a tactic of systematic starvation and defunding of the city (famine tactics, so beloved of ruling British colonialists) Hillsborough presented them with a golden opportunity to put the boot in on an unprecedented attack on the city via it's emblem of unity and resistance - Liverpool FC, using the supporters and fans of the team to try and turn the city against itself whilst demonising the people of Liverpool as scum and drunken thieves, robbing the dead and dying on the pitch. Only it didn't work. It galvanised people and they fought back. For twenty seven years. And they've won. Finally they are vindicated. What we now need is the same level of investigation into Orgreave and the Miner's Strike. This isn't over.